Collections ⁄ Gifts ⁄ Gifts for Her ⁄ Drink More Fizz! In victory or defeat, champagne is the drink of choice. And for every other occasion in life, a bottle of fizz is guaranteed to help you celebrate, commiserate, heal and revive. 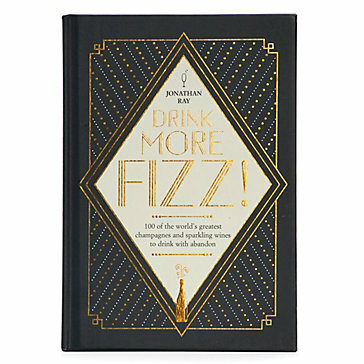 In this new book, fizz fanatic Jonathan Ray, drinks editor of the Spectator - tells you everything you need to know to pick the perfect bottle of bubbles every time - whether you want a good value pick-me-up, a case to get a party off with a bang, or a bottle of something dazzlingly good for that really special celebration. With tips on the right type of glass to use, a glossary of wine terms, and recipes for champagne cocktails, you will never want to drink anything other than fizz again! Jonathan Ray is drinks editor of the Spectator. Prior to this he was drinks editor of GQ and spent many years as wine editor of the Daily Telegraph. He was also the anonymous Bar Spy for Imbibe magazine. He is the author of several books on wine – translated into over a dozen languages and with combined sales of almost 300,000 copies. As well as his regular drinks columns, he has written on food, travel, lifestyle and many other subjects for the Spectator, the Guardian, Decanter, the New Statesman, the Daily Mail and the Mail on Sunday.